I held back at Waldo Flea Market but came home with some gorgeous finds. I went back and forth on the radio above but eventually purchased it for $25- one of my more if not most expensive flea market purchases. It makes an impact in a space and makes a great conversation piece. It's on Etsy and in my Southern Crossing booth. 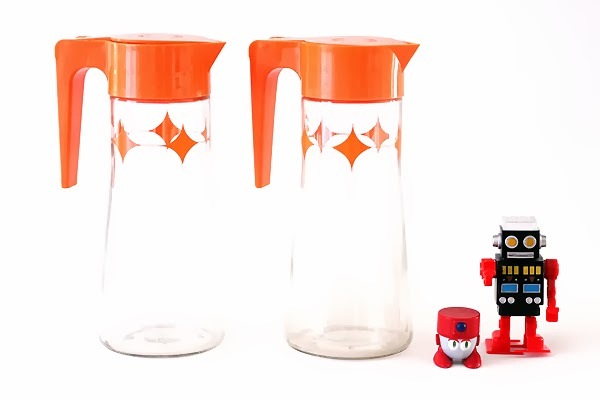 I also paid more than I normally would for these beautiful atomic starburst bearing orange lidded decanters. Beautiful. They're chilling in Southern Crossing and on Etsy but I may take them home for tea and infused waters. On Etsy. And continuing with the uncomfortable trend of paying more than I wanted to for the "good stuff" that continued until today, boo! 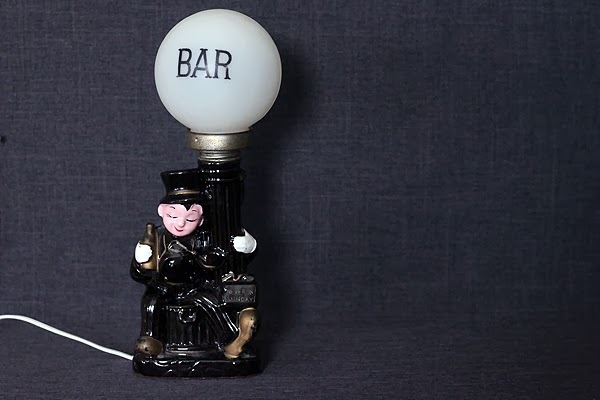 Anyway, he's a beau, gorgeous to illuminate a home bar. See him on Etsy and locally in my booth. On Etsy. 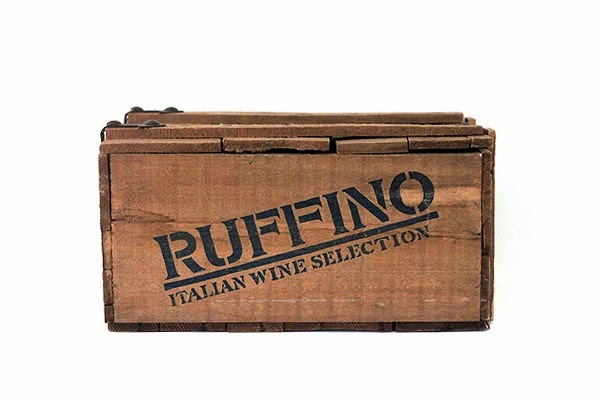 This gorgeous large Ruffino crate sold within a couple of hours of being list. The last couple of times that happened (well, for those it was minutes) those turned out to be super valuable pieces (in the case of one, something I listed for $28 that has won bids at over $700, OH MY SOUL) so I hope this crate wasn't randomly super valuable. Can't help it now, it's on the way out to its new home before I got to enjoy it as storage or use it as a display in my antique mall booth. Anyone have tips on where to find beautiful vintage crates like this for less? Trying to find some for local displays. 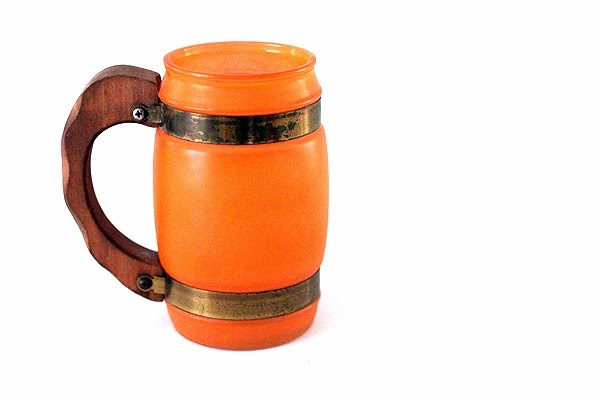 This gorgeous orange siesta-ware beer stein came with me despite my mind's plaintive cries to leave all slow-selling serving-ware behind to languish anywhere other than my apartment where it will torment me, it's retina blinding neon rays searing into my physche... Buy it on Etsy, get it away! 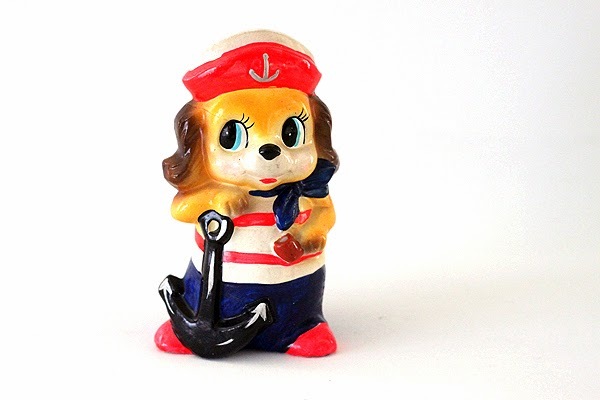 And this sailor dog girl statute had to come home with me for similar reasons, she's so attention-grabbing, love her lashes. On Etsy. I've decided to dub this piece "Serendipity Willie". So lucky that he was languishing in Waldo in such beautiful condition and by the time we got there around 10ish after the early birds made their rounds. I handed over one dollar and he was mine. While totting him around in my market cart there were coos of admiration and sighs of want for Willie, in his rugged neck-beard and fabulous jacket-hat combo. He may be the tackiest thing I've ever bought, that's saying something as a person who makes a living buying/selling/branding kitsch with a display of giant Power Ranger Megazord robots in her kitchen. Willie sold to blog reader Eric (thank you!) when he randomly asked if I happened to have an Elvis velvet paintings in stock right after Willie came into my life. Enjoy him Eric, he's glorious. These two were free! There's so water damage so I'm selling these for $5.00 each. 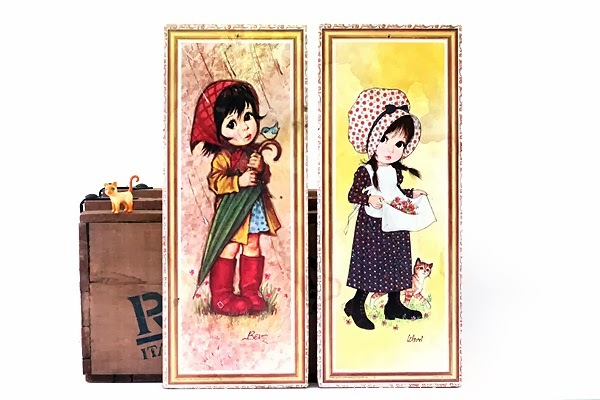 These were in the bedroom of nearly anyone who was a little girl in the sixties, so I'm told. 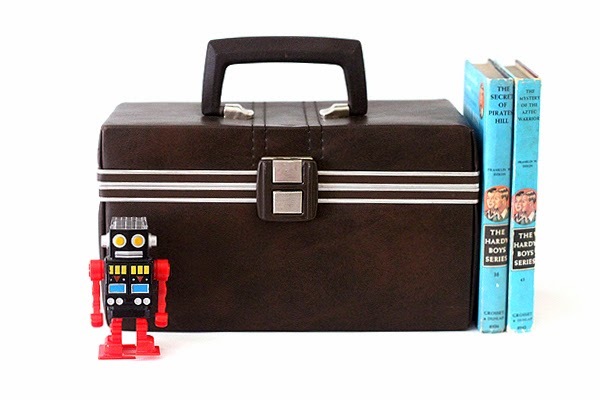 My mom had these exact ones. Very nostalgic. On Etsy or E-mail me if you'd like either one. And a beautiful train case to admire and add to my collection of ones that are randomly sitting longer than these things normally do. I love the color. On Etsy. And a Horny Devil for your enjoyment. I like him as a valentines gag gift. On Etsy. 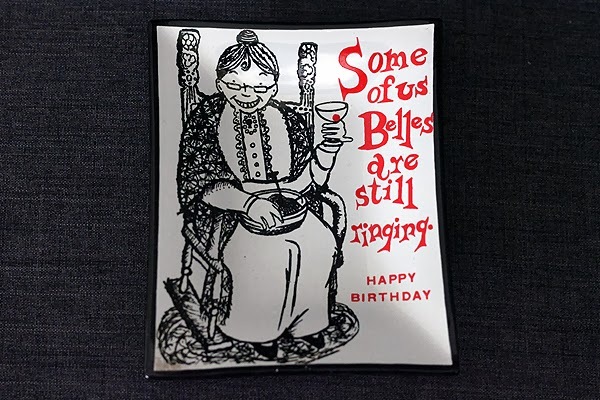 And I finally got me this tray! I've been admiring an identical one locally for years. YEARS coveting it at $45 or something crazy and I got my own from the Willie Nelson-seller for another $1.00! I didn't even see it until my second time circling her stall on the way out. On Etsy. And I love these little glass tray guys. I use them to hold memory cards, little digital parts, keys and little extras around the house. On Etsy. My strategy to be very selective and only buy what I thought would sell paid off with this trip. Already made $119 from three of the items, hell yeah! And with that I escape to force myself to accomplish EVERYTHING on the to-do list today, or else! What did you find this weekend? Do share in the comments. Oh how I wish I would've seen this Willie painting and asked you first :( Love it!!! Want(ed) it. Thrift on. lori@zukini.net Anything Willie lol (+ black velvet painting, probably not again!!!!) :) Thanks! Have a good one!! You never know, I do a lot of hunting and there's loads of vintage/Willie fans where I live. Fun finds! Glad they're selling for you too. Those orange pitchers, by the way, are "Tang" pitchers from the early/mid 70s. Ah ha! Thanks so much for the ID. They were connected with "Tang" the sugar-drink? I think you could buy those pitchers cheaply at the grocery store right alongside the Tang. Or maybe they even had Tang in them when you purchased. We had one. Personally I never was a Tang fan. Ah! Willie! I would probably keep that one. He's fantastic! He's already sold. Wish I would have went a bit higher, oops. I keep selling crap for waaaaay too low. Sick of it, going back and raising some TODAY, dammit. Yes! Tang pitchers, we had one. It made Tang taste even better! 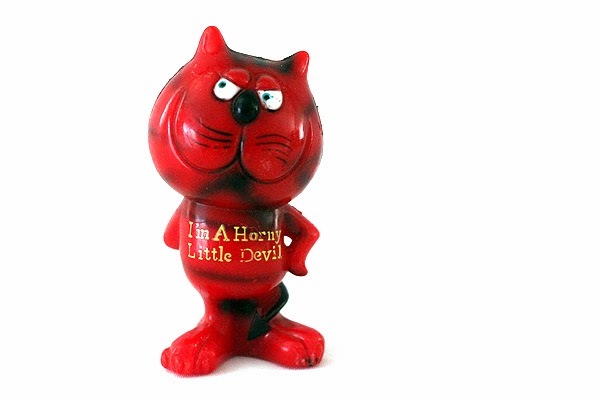 I love that horny little devil, too cute! I have not come across too many goodies at the thrift stores lately....bummer! Maybe this week will be better. Heading out a bit later to check a few out! Send me some good mojo! Good luck hunting. Can't believe something so atomic-looking and gorgeous went with Tang! :D I loved my sugar-water drinks as a kid. Wouldn't touch them now. I have one of those same tang pitcher...did not know it was a tang pitcher when I got it but found out. It sits with a cute orange/lemon slice graphic juice carafe on a shelf in my kitchen and on my etsy shop! Love you finds! Spending this week listing a bunch of stuff AND putting together a booth in my new town! I wouldn't mine using mine until they sold but they're in my booth right now. Congrats on your new booth! I'm trying to wrangle up the energy to switch out my two booths. Hope to have one large one instead of two small ones soon. I love that small turntable! I would love one like that - good call, you will now have to buy any you see like that. I think you should try and sell Willie with a description like: Going to a tacky housewarming party? Be the belle of the ball with the tackiest gift there - Velvet Willie! He already sold long before this post went up. Next time will definitely sell any Willie vintage thing for more. This is your best haul AUUU so many unique pieces!! I already visited your etsy shop and favourite some items so you get more traffic ;) I think you should have the Kitchen Decanters with white on the back, looks more appelative to me. Guess this was those epic flea markets!! I thought the same on the decanters and switched the photo, tried the dark gray in a rush because the white does wash out the edges. May try the light gray backdrop later. Definitely scored a great assortment of finds at Waldo. that little turntable is adorable and looks a lot like mine...even though mine is modern. Sad I have to ship it out now ;D Been wanting a little one for my records, may find another in my hunts. wow. great haul! 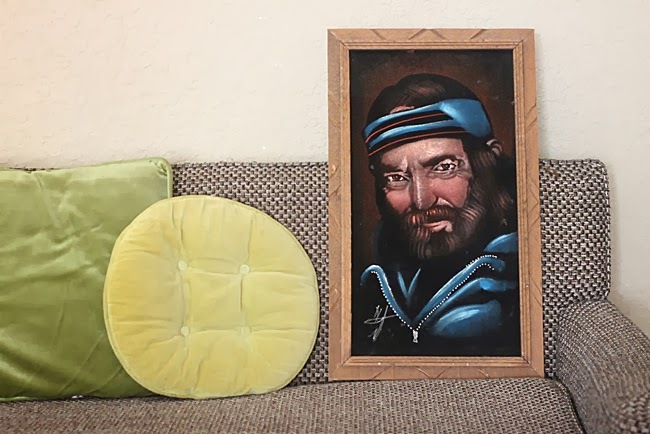 gotta love tacky velvet paintings! Indeed! Always on the prowl for them. 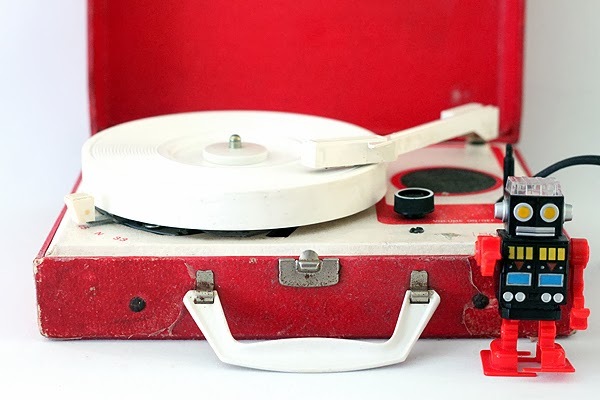 I love that little red record player, just so cute. 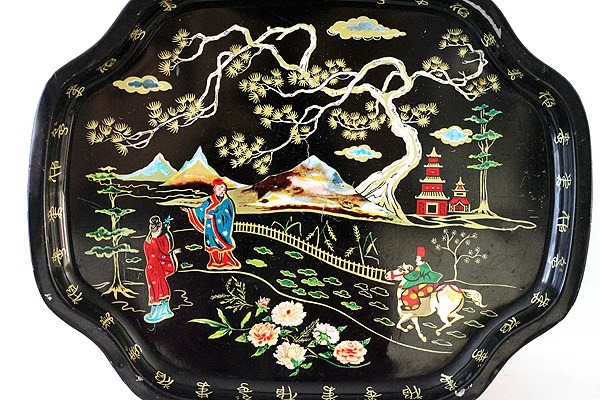 I have one of those baret ware trays, got it at a car boot for 50p! My boyfriend has added some barley twist legs to make it into a small side table. I love it so much. Great finds as usual Van! I am wondering how you have something at Southern Crossing and on etsy that would make me a nervous wreck! What happens if it sells simultaneously ( although I know it is unlikely) :-) Anyways love reading your blog. Im booth 747 round the bend from you. I have two now but I hope to have one big booth or to downsize to a small one soon, not sure what path I'll take with SOCO yet. Will definitely find you and check out your wares, though I've probably already seen it in my walkthroughs :D I've had things sell simultaneously before, one time early on I sold something for $28 in Southern Crossing that later sold online for $100, ugh. Now I put things in at the same price or maybe only slightly less. A couple of times I've had to e-mail the customer and humbly apologize that the item sold and give a refund. It's a weird choice I make but one I like. It's double the work to find gorgeous quality new goods for both my booth and online and I don't have lots of inventory storage space. Love it all! That radio and red turntable especially. And on a side note, I usually dislike faux vintage. 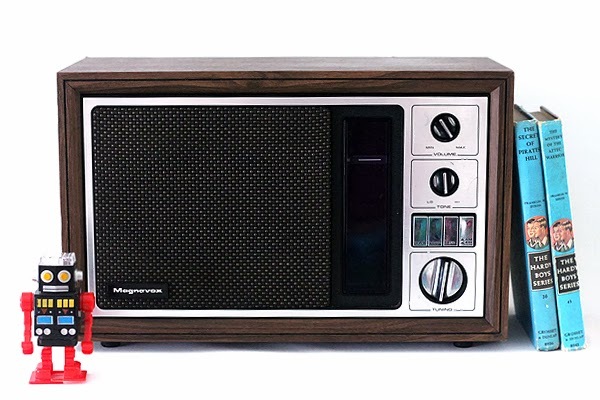 But I have one of those wooden vintage-deisgn turntable/CD/mp3 players and it actually has a decent sound to it. (You can even rip the vinyl to CDs, if you so desired). 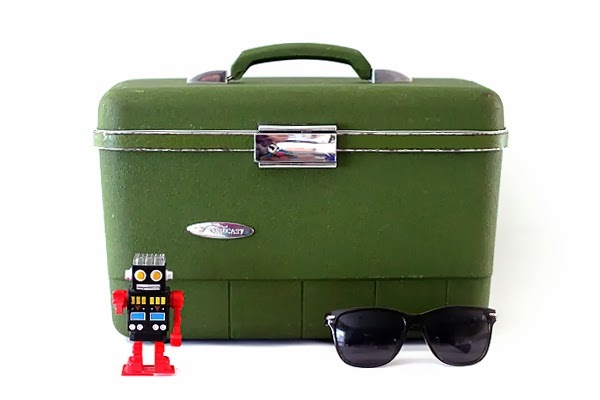 Of course I also have a more portable briefcase style turntable, for those summer nights lounging outside. I do love my record collection. I will have to find another one to keep someday, love the portable appeal. Indeed. I need to hunt more, too. I only hunt maybe once a week. Van SO MUCH good stuff! My week was spent cleansing in prep for vacation--I love the bright orange mug, I might need to buy it! Dooo eeet ;) Have fun on your trip and good luck cleaning and prepping! I'm glad to hear that your more selective buying strategy has already started paying off. I started really working on rethinking my buying about a year and a half to two years ago, and it has been paying off. Earlier this week I went on a buying trip with a fellow eBay seller who taught me to research everything to see what sells and for how much. We used the eBay app on our phones to look for similar items that have sold recently. 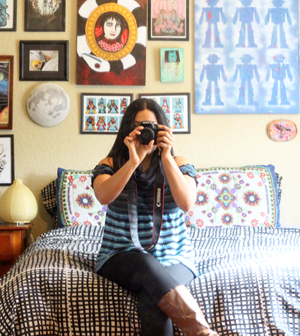 This is a great strategy for getting ideas for how to price your items. Almost everything we looked at was vintage. I feel so re-energized now about my business after that trip.